Last Saturday I attended a performance by The Israeli-Palestinian Comedy Tour. This is a group of four stand up comedians, three of them Jewish and one Palestinian. The show was at the JCAA so the vast majority of the audience was Jewish. Interesting timing with Operation Cast Lead in Gaza serving as background. The show lasted a little under two hours. They opened with a short sketch and then each of the comedians did a stand up routine. They were very funny and I recommend the show. By far the funniest was Ray Hanania, also a journalist and the sole Palestininan in the group; and the only one who covered the Israeli-Palestinian conflict in a more direct manner. The rest did a more generic Jewish/Israeli routine – lots of it centered around Israeli driving habits and circumsicion. 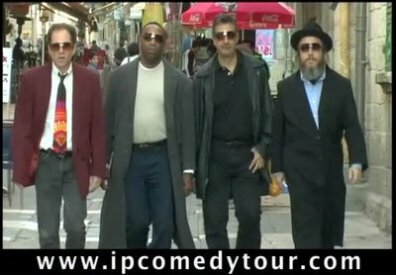 While The Israeli Palestinian Comedy Tour does a great job of exposing the views and voice of a moderate but less vocal majority in the conflict using humor, it’s disappointing when you take a closer look: None of the members were actually born in Israel or Palestine. Two of the three Jews in the group are recent converts. No muslims either. I couldn’t say they are exactly perfect insiders to the issues at hand nor the best demographical representation one could have hoped for. Also dissapointing: my interview with KUT did not make the cut.